Not the least of the myriad variables affecting biathlon races, fickle weather has played games in Pokljuka, Slovenia, site of the first round on the IBU World Cup. The men’s 20-kilometer individual race was originally scheduled for Wednesday, but was postponed to Thursday due to fog. For each missed shot in the individual races, athletes are penalized one minute. With a large cost for any shooting mistake, a single miss can punish a potential podium performance. None other than France’s Martin Fourcade took the win today in 47:09.2 minutes. (Fourcade is a seven-time winner of the overall IBU World Cup.) 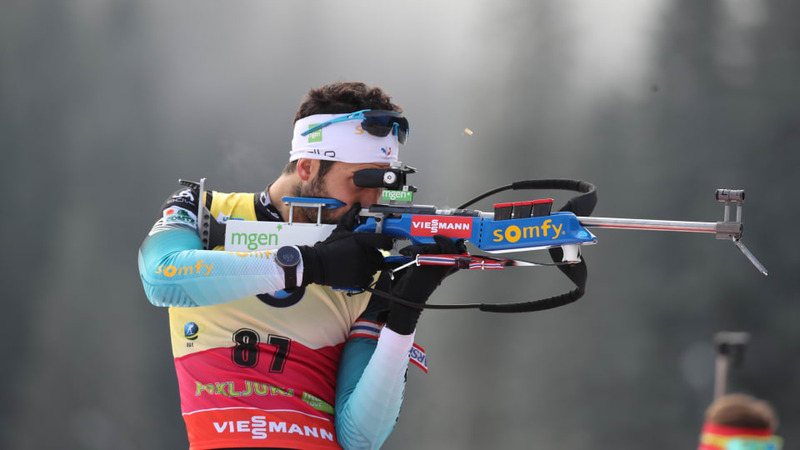 Fourcade shot clean in all four of his shooting bouts. And shooting clean was the theme for the podium, the top-three finishers had no misses on the shooting range. Second place went to Johannes Kuehn of Germany, finishing 4.2 seconds back. Third place was secured by Simon Eder, who stopped the clock 19.7 seconds back. For Canada, Scott Gow skied to 14th (+1:43.3) with one miss. Brother Christian Gow was 16th (1:59.2) after also missing only a single target. Brendan Green skied to 100th (+9:04.1) after difficult shooting, during which he missed seven targets. Nathan Smith did not start. For the U.S. Leif Nordgren was the best placed American in 40th (+3:24.5). Nordgren missed two shots. Teammate Sean Doherty was 59th (+4:28.2) after missing three shots, Max Durtschi was 102nd (+9:37.0), after missing six targets. Travis Cooper raced to 105th (+10:02.0), while missing six shots. The women’s 15 k individual was won by Ukraine’s Yuliya Dzhima 43:06.6 minutes. She was clean in her shooting in her first career IBU World Cup win. Poland’s Monika Hojnisz had a single penalty as she placed second (+5.9). The result was a best-ever result for Hojnisz at this level of competition. The Czech Republic’s Marketa Davidova also missed a single target on her way to her first career podium, finishing 16.5 seconds back in third place. U.S. biathlete Susan Dunklee missed one target on her way to placing 11th (+1:00.09). With each miss adding an additional minute to an athlete’s finishing time, it was a solid effort and indicator for Dunklee. “I’m psyched to have a great result so early in the season,” Dunklee emailed FasterSkier. Dunklee, the U.S. team veteran, made note of U.S. skier Clare Egan’s race day performance. “Clare also threw down an impressive ski split, so in spite of our 3 start quota challenge, our team future looks bright,” Dunklee added. Egan placed 60th (+4:23.3) after amounting five penalties. She raced the 13th fastest ski time. Emily Dreissigacker, also for the U.S., placed 69th (+5:17.0). Dreissigacker has four penalties. Canada’s Megan Tandy finished in 62nd (+4:30.4), after missing three shots. Rosanna Crawford, also for Canada, was 64th (+4:34.7) with four misses, Meghan Bankes 71st (+5:22.) with three misses, and Nicole Moser 98th (+10:20.4) with seven misses.